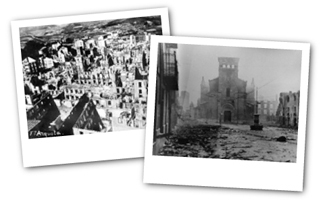 THE BOMBING OF GERNIKA. AN HISTORIS EVENT. The military campaign in the Basque Country demonstrated the psychological and military importance of air superiority, as is maintained by the most solvent historiography of the civil war. From their base in Vitoria the �nationals� found themselves in a favourable situation to bomb and chastise, without the possibility of a republican response, whilst the republican command did not appear to be willing to risk their plans by flying over territory controlled by Franco�s army. It is generally held by current historiography from and elementary level that, their bombing campaigns were directed against small towns in the Basque Country, of which, �the most famous was Gernika�. This attack provoked the fire and destruction, generating peoples� contempt and motivating the imagination of the entire world. In the beginning, above all, by the spectacular dispatches emitted by the correspondent from The Times, Geroge L. Steer (�) and subsequently by the creative imagination of Picasso. Monday, April 26th 1937, the Condor Legion bombed the town continuously for three hours. (�) The two supposed primary military objectives- the bridge of Renteria and the arms factories- remained intact after the bombing. Unharmed remained also the the tree of Gernika, symbol of ancient Basque liberties. Cava Mesa, María Jesús: Memoria colectiva del bombardeo de Gernika. Bilbao: Bakeaz and Gernika Gogoratuz, 1996.- 332 p.